The Shiripuno region of Ecuador is wild and relatively untouched; one result is the presence of numbers of large birds like the magnificent Salvin's Curassow. We were treated to multple views of these rare birds during our visit. Photo by guide Mitch Lysinger. Shiripuno Lodge welcomed us into the wilds of Ecuador's Amazon this year for a fabulous week of birding and exploration, and what a week it was, indeed! We were dazzled by rare and little-seen birds, and had the time to soak in the natural world in an environment well away from the modern world. Much of the heartland of the Waorani is still in a pristine state, which is what makes a visit to this corner of Ecuador so special. Hikes through gorgeous forest - sure, we had a downpour or two! - and relaxing canoe rides along the river under some fabulous light were a daily event, and we lived it up to the max! Shiripuno is indeed everything that a more luxurious lodge closer to civilization is not - more basic living conditions with candlelit rooms, and no laundry service - but isn't this what it is about? Getting away and unplugging, with nobody around, and really feeling enveloped by the Ecuadorian wilds? You bet it is! But the lodge is comfortable and the best place I've ever seen for Woolly Monkeys as they come in and forage in the Cecropia trees right next to the lodge every afternoon... what a treat. We had some memorable sightings this week, but the favorites are all of personal choice, of course! From a leader's standpoint, these are some finds that really helped make our trip a genuine success and a unique one: how about all of those cracid species, but the multiple groups of stunning Salvin's Curassows out along the river really blew us away; those close Sunbitterns out along the river; Sungrebe a couple of times swimming about; that day-roosting Tawny-bellied Screech-Owl that Pablo so expertly found; Great Potoo on day perches, that Common Potoo that came in and perched in camp, but especially the pair of amazing Rufous Potoos that sat right in front of us at point-blank range in the spotlight behind the lodge... wow; that mesmerizing male Fiery Topaz feeding right over the river one memorable afternoon; those colorful Green-backed Trogons around camp; some fantastic puffbirds, but I think the scoped Collared and White-chested stole the show; White-eared, Yellow-billed, and Great Jacamars, all scoped and seen well; great views at all three possible barbet species, including males of Lemon-throated; some fabulous and colorful toucans, like Golden-collared Toucanet and Ivory-billed Aracari; a few killer woodpeckers, but how can you forget that Cream-colored, or the pair or Red-necked (? ); some nice scope views at the beautiful Orange-cheeked Parrot; those cute, and rare, Dusky-billed Parrotlets in the canopy through the scope; macaws galore, highlights being those awe-inspiring Blue-and-yellow and Scarlet (! ); more antbirds than most birders could ever absorb, but how about those great looks at Pearly Antshrike, Brown-backed Antwren, and Yellow-browed and Lunulated Antbirds (? ); those excellent views of the rare Spot-throated Woodcreeper; that spritely Ringed Antpipit; scoped Black-necked Red-Cotinga; Amazonian Umbrellabird at a fruiting tree; some splendid manakins, including Blue-backed and Striped; full-frame scope studies at Brown-winged Schiffornis; good looks at that sneaky Musician Wren; a menagerie of unbelievable tanagers, with the likes of Masked Crimson, Opal-rumped, and Green-and-gold; and those handsome Green Oropendolas right around camp. We also enjoyed some noteworthy mammal sightings of the area, including a couple of scarce White-bellied Spider Monkeys at close range, a few groups of Dusky Titi Monkeys, and that family group of Capybaras that came swimming across the river right in front of us! Fernando (our host), and Pablo (our expert birding guide, with the eagle eyes and relaxed disposition), really took care of us and made our stay comfortable and one we shall never forget. I can't wait to get back and dive head-first into this spectacular biome, and want to thank you all for making this trip such a joy to lead. Good birding, and have a read through the list that I'm sure will kindle a few memories! 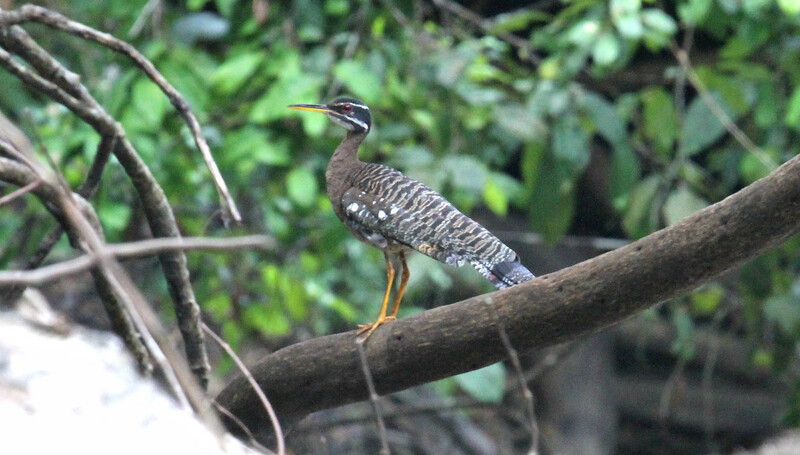 We had some wonderful close views of the stunning Sunbittern on several canoe trips. Photo by guide Mitch Lysinger. SPECKLED CHACHALACA (Ortalis guttata) – Plenty of them out along the river. SPIX'S GUAN (Penelope jacquacu) – The large guan with the red dewlap, of which we had many fine studies out along the Shiripuno River. BLUE-THROATED PIPING-GUAN (Pipile cumanensis) – The common guan of the area; seen at just about every bend of the river! 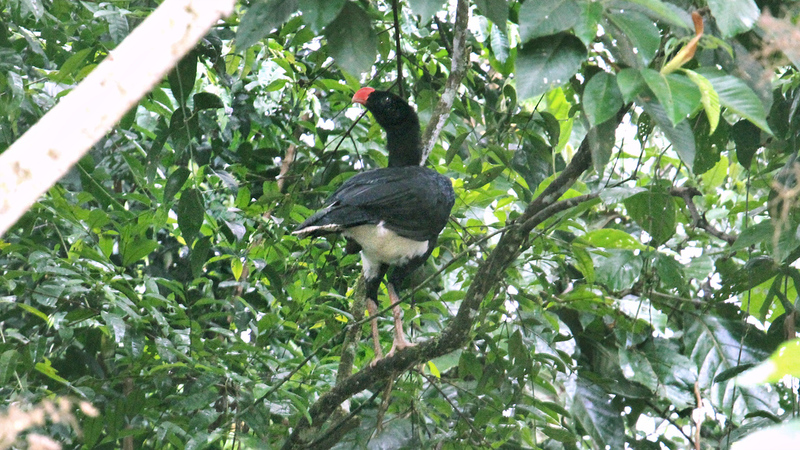 SALVIN'S CURASSOW (Mitu salvini) – One of the main targets for this trip, and we nailed it on our first day when we ran into a pair feeding at a fruiting tree right over the river at close range... wow! As if this weren't enough, we lucked into yet another three pairs out along the beaches in the early morning as we motored back up-river on our last day... a fitting farewell. RUFESCENT TIGER-HERON (Tigrisoma lineatum) – One adult perched for us out along the river one evening. COCOI HERON (Ardea cocoi) – A single bird on our entry day along the Shiripuno River. CATTLE EGRET (Bubulcus ibis) – Carroll spotted one for us one afternoon during a cruise along the river. STRIATED HERON (Butorides striata) – A single bird on a our last day. GREATER YELLOW-HEADED VULTURE (Cathartes melambrotus) – I was starting to wonder where these guys were, but we came on strong on the second half of the trip with plenty of fine views of them perched, and in flight. Yes, it is a vulture, but that yellow head makes it somehow attractive. KING VULTURE (Sarcoramphus papa) – A striking, large vulture that we had nice views of out along the river when one came soaring over in nice afternoon light. SLENDER-BILLED KITE (Helicolestes hamatus) – The first bird we found after boarding the canoe along the Shiripuno River... it only took one bend of the river to find a write-in bird! DOUBLE-TOOTHED KITE (Harpagus bidentatus) – Perched views out along the river. PLUMBEOUS KITE (Ictinia plumbea) – The most common raptor at Shiripuno this year. CRANE HAWK (Geranospiza caerulescens) – This one put on a show as it flopped about in the green fruits of a palm tree one afternoon; Pablo said that he thought that it was collecting nest material. GREAT BLACK HAWK (Buteogallus urubitinga) – We had our best looks on the last day as we made our way up the river when we spotted an adult at close range. ROADSIDE HAWK (Rupornis magnirostris) – Several out along the river. WHITE HAWK (Pseudastur albicollis) – A pair seen zipping over along the Colibri trail. SUNBITTERN (Eurypyga helias) – A stunning bird that we had around the midway point of the trip, in and out of Shiripuno lodge, along the river. Our first encounter was the real bomb when we had killer views of a pair right on the beach, and so close to the canoe. SUNGREBE (Heliornis fulica) – Some good views of this duck-like species on our entry day into Shiripuno. This Yellow-browed Antbird allowed us to get nice scope views. Photo by guide Mitch Lysinger. SOUTHERN LAPWING (Vanellus chilensis) – Seen flying off on our first day. PLUMBEOUS PIGEON (Patagioenas plumbea) – Seen perched up along the river on the first day. RUDDY PIGEON (Patagioenas subvinacea) – And we had this more richly colored pigeon along the river on the last day! RUDDY QUAIL-DOVE (Geotrygon montana) – On our final day, as we motored back upriver, when one surprised us by making a flight out over the river before disappearing back into the forest. GRAY-FRONTED DOVE (Leptotila rufaxilla) – Heard many times over the course of the trip, but we did see one, albeit briefly, flying by out along the river. HOATZIN (Opisthocomus hoazin) – We hunted them down at a nearby oxbow lake one afternoon, and finally managed to get them in the scope. What really surprised me was how wary they were; these guys are usually loud, out in the open, and easy to see, as they flop about. Wonder what they were up to? SMOOTH-BILLED ANI (Crotophaga ani) – Common in open areas. SQUIRREL CUCKOO (Piaya cayana) – Surprisingly scant this trip, but we did have them a couple of times briefly. Carroll probably had the best look of the trip right around camp, while we combed the trails! BLACK-BELLIED CUCKOO (Piaya melanogaster) – A stunning cuckoo of the forest canopy that we fished out a few times for good looks. TAWNY-BELLIED SCREECH-OWL (Megascops watsonii) – Pablo went out in search of the day roost of the Rufous Potoo, but ended up finding this one in a dark vine tangle instead. Well, we didn't waste any time, and dashed out to see it, as it was only about 150 meters behind the lodge; it ended up being so close that we couldn't even get the entire bird in the scope! FERRUGINOUS PYGMY-OWL (Glaucidium brasilianum) – Nice scope views one afternoon out at an oxbow lake before a storm rolled in. COMMON PAURAQUE (Nyctidromus albicollis) – Nice spotlight views at a male as it flitted about us right next to the dining room in camp. GREAT POTOO (Nyctibius grandis) – Some excellent views of this large potoo on day roosts along the Shiripuno. Cris spotted our best one just downriver from the lodge as is sat up in a large Ficus tree that leaned out over the river... awesome! COMMON POTOO (Nyctibius griseus) – We had a wonderful time right around camp with this fascinating species as it called and perched up for us in the spotlight... wow! RUFOUS POTOO (Nyctibius bracteatus) – One of the big trip highlights! We had been trying to find this one on a day roost, but Pablo - our point man for this one - just couldn't quite track it down, which can be extremely difficult as they find hiding places that not even super-human eyes can find sometimes. So, we decided to hit the trail just behind the lodge in the early evening and try and call one in. Once in place, we had a pair start calling and come swooping in only to land meters away, such as on a low, broken-off dead tree right in front of us for crippling views. SPOT-FRONTED SWIFT (Cypseloides cherriei) – One came floating over along the river, but a very difficult bird to identify. WHITE-COLLARED SWIFT (Streptoprocne zonaris) – The large swift that we saw soaring high over the Shiripuno River. SHORT-TAILED SWIFT (Chaetura brachyura) – Easily recognized with those swept-back wings, that the cropped-off tail, and thick secondaries; we had them almost daily along the river. Black Caracara was an every-day bird for us! Photo by guide Mitch Lysinger. GRAY-RUMPED SWIFT (ASH-RUMPED) (Chaetura cinereiventris sclateri) – Sleeker, and with a longer tail than the previous species. Seen a few times during the trip. LESSER SWALLOW-TAILED SWIFT (Panyptila cayennensis) – A neatly "dressed" swift that we saw in nice light over the Shiripuno River a few times. FORK-TAILED PALM-SWIFT (Tachornis squamata) – A dainty little swift with a long, pointy tail, and one of the most common swifts of the area. FIERY TOPAZ (Topaza pyra) – I dare anybody to find a more electric hummer species, anywhere... unbelievable! We dedicated an evening to staking out a spot, just upriver from the lodge, that is known to attract a male where it comes to hawk insects before heading off into the twilight to its roost. Although we had to improvise a tad as the bird decided this evening to shift to a slightly different spot just upriver, our effort was a resounding success. Not only did we see the bird in all of its glory, as it called and fed about, but we found a small beach to set up the scope, and score fabulous studies at high power! Sometimes this darker evening light is actually better for hummers, rather than direct, bright light. One to remember, for sure! PALE-TAILED BARBTHROAT (Threnetes leucurus leucurus) – Excellent looks at a feeding bird right in camp as it visited a Heliconia flower patch. It's rufousy chest was in evidence! STRAIGHT-BILLED HERMIT (Phaethornis bourcieri) – Seen well at a lek along the Mirador trail. GREAT-BILLED HERMIT (Phaethornis malaris) – Scope views of birds at a lek behind the lodge as they bobbed their tails and sang their hearts out. The dark red mandible is very prominent on this species. FORK-TAILED WOODNYMPH (Thalurania furcata) – Various females a few times. GOLDEN-TAILED SAPPHIRE (Chrysuronia oenone) – One quick bird along our ride back up the Shiripuno River on the last day. BLACK-TAILED TROGON (Trogon melanurus) – Our best encounter with this species was when we called up a fabulous male out along the river, and got it to sit right overhead as we relaxed in the canoe. GREEN-BACKED TROGON (Trogon viridis) – Stunning males a few times. AMAZONIAN TROGON (Trogon ramonianus) – A small Trogon. The Amazonian Trogon is a split from from the Violaceous Trogon, and we had good looks at a pair along the lower stretches of the Mirador trail where they might have been investigating a nest site. AMAZONIAN MOTMOT (Momotus momota microstephanus) – Seen briefly by most through the scope as one called right over the main cabins... wish it had stayed around a bit longer! AMAZON KINGFISHER (Chloroceryle amazona) – A large-billed kingfisher that we saw most days. GREEN KINGFISHER (Chloroceryle americana) – A smaller version of the previous species. WHITE-NECKED PUFFBIRD (Notharchus hyperrhynchus) – Nice looks at this chunky, and strikingly patterned puffbird along the Shiripuno River a couple of times. PIED PUFFBIRD (Notharchus tectus) – Scope views from the lodge for most folks at this small puffbird. COLLARED PUFFBIRD (Bucco capensis) – A stunning puffbird with that orange head and coral-colored bill. Pablo spotted one for us near the lodge for sensational scope views, that we shall never forget! WHITE-CHESTED PUFFBIRD (Malacoptila fusca) – We dug one of this secretive, understory species out along the Puyuno trail as it sang for scope studies... memorable! BLACK-FRONTED NUNBIRD (Monasa nigrifrons) – Common out along the river edge. WHITE-FRONTED NUNBIRD (Monasa morphoeus) – Scope views along the Skutch trail were a welcome sight. YELLOW-BILLED NUNBIRD (Monasa flavirostris) – We called one in for nice scope views up along the Mirador trail as it called actively. SWALLOW-WINGED PUFFBIRD (Chelidoptera tenebrosa) – Seen daily along the river, such as right at the lodge where they perched daily in the trees next to the cabins. We weren't quite sure what these Black-headed Parrots were up to, but they gave us a good view as they clambered around on this large tree. Photo by guide Mitch Lysinger. WHITE-EARED JACAMAR (Galbalcyrhynchus leucotis) – It took us right up until the last day to turn this handsome jacamar species up when we found a pair during a stop on our way back to Coca. YELLOW-BILLED JACAMAR (Galbula albirostris) – Fabulous scope studies at a responsive bird along the Puyuno trail. GREAT JACAMAR (Jacamerops aureus) – This large jacamar offered up some nice views along the Skutch trail when we called one in for scope studies. SCARLET-CROWNED BARBET (Capito aurovirens) – We had a pair on our first day right at the Shiripuno bridge. GILDED BARBET (Capito auratus) – The common forest barbet that we saw well a few times. LEMON-THROATED BARBET (Eubucco richardsoni) – The scope views of that male along the Skutch trail captivated us! CHESTNUT-EARED ARACARI (Pteroglossus castanotis) – The aracari with the red belly-band that we saw on our last day. MANY-BANDED ARACARI (Pteroglossus pluricinctus) – The most common forest aracari of the area; we had plenty off fine views of this one as it sported its two dark belly-bands. IVORY-BILLED ARACARI (Pteroglossus azara) – Excellent scope studies a few times at some family groups. GOLDEN-COLLARED TOUCANET (Selenidera reinwardtii) – Neck-breaking scope views at a male on our first full day of birding out of the lodge; the angle was tough, but well worth it! WHITE-THROATED TOUCAN (CUVIER'S) (Ramphastos tucanus cuvieri) – The large-billed yelper; common around Shiripuno and the rest of the Ecuadorian Amazon. CHANNEL-BILLED TOUCAN (YELLOW-RIDGED) (Ramphastos vitellinus culminatus) – The smaller version of the previous species, but the voice really helps set them apart. We enjoyed some nice views of them through the scope as they called. 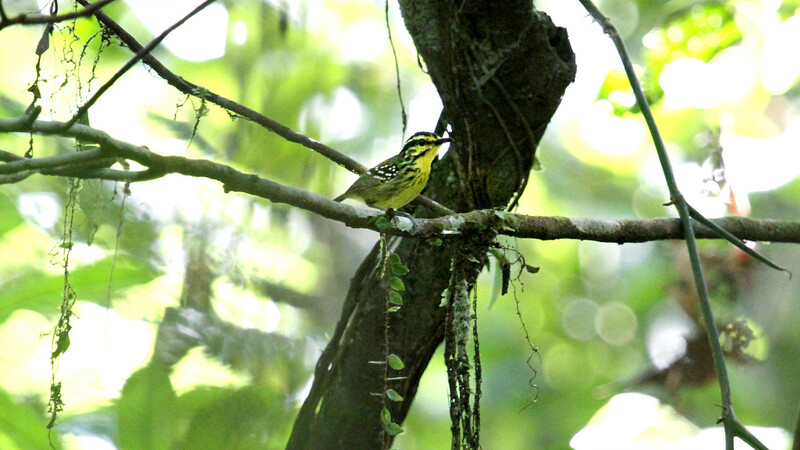 YELLOW-TUFTED WOODPECKER (Melanerpes cruentatus) – Those yellow spectacles were in evidence! We had plenty of fine views. LITTLE WOODPECKER (Veniliornis passerinus) – Seen well at the Shiripuno bridge on our first day. GOLDEN-GREEN WOODPECKER (Piculus chrysochloros) – Superb scope studies right from camp when a male perched up in the overhead trees. CREAM-COLORED WOODPECKER (Celeus flavus) – A splendid woodpecker that we fished out a few times for killer views. CHESTNUT WOODPECKER (Celeus elegans) – One flew over the river on our last day for pretty good views. 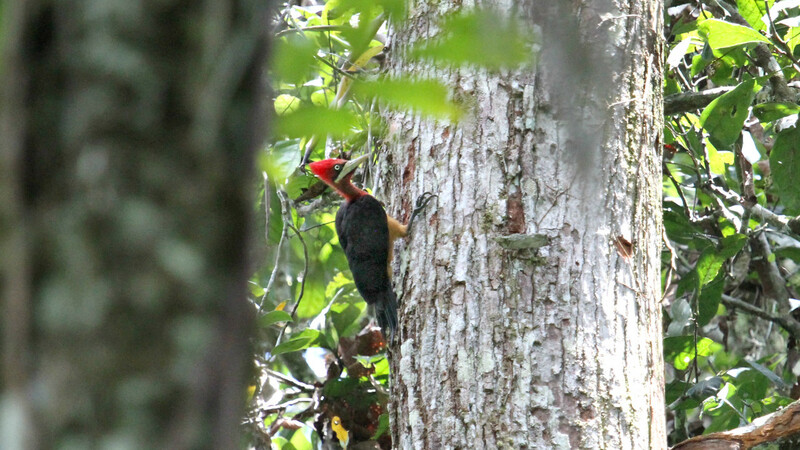 LINEATED WOODPECKER (Dryocopus lineatus) – Seen on our first day during the canoe ride down to Shiripuno Lodge. RED-NECKED WOODPECKER (Campephilus rubricollis) – Crippling views at a pair along the Puyuno trail as they crept about overhead in the large trees next to a clearing... awesome! CRIMSON-CRESTED WOODPECKER (Campephilus melanoleucos) – Excellent views at males and females numerous times. BLACK CARACARA (Daptrius ater) – Seen everyday of the trip! RED-THROATED CARACARA (Ibycter americanus) – Scope studies of this loud and raucous caracara on our first full day of birding around the lodge. 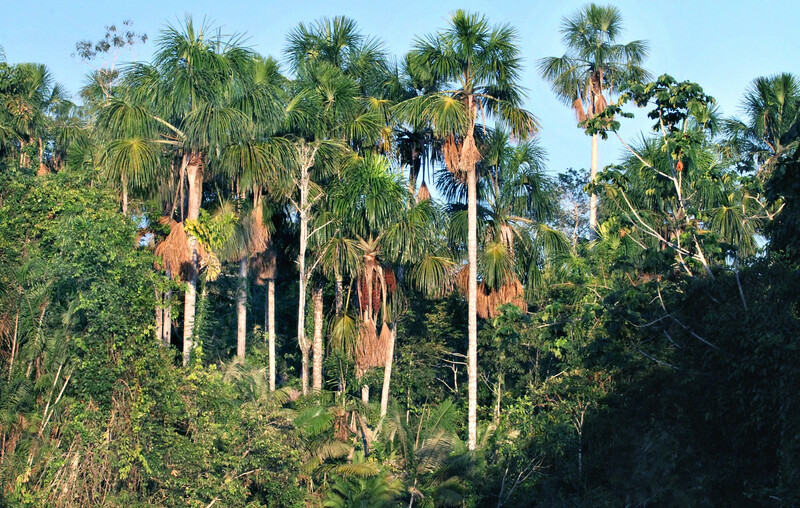 One of the important habitats in the Shiripuno area is the Moriche palm swamp. Photo by guide Mitch Lysinger. 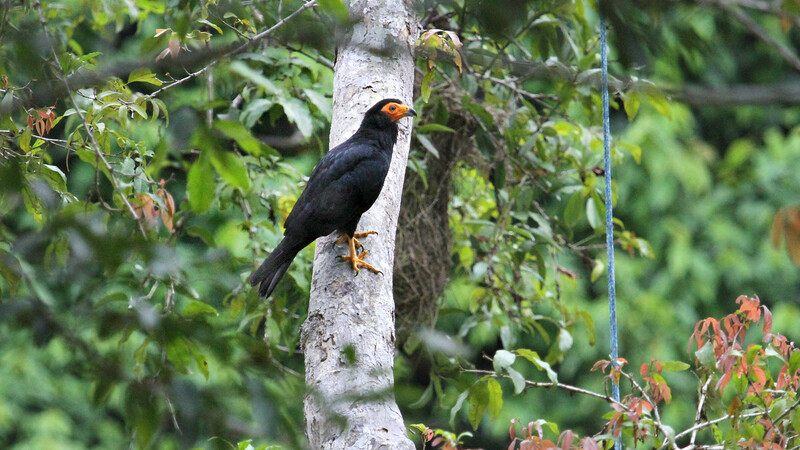 YELLOW-HEADED CARACARA (Milvago chimachima) – Carroll spotted one on our first day. LAUGHING FALCON (Herpetotheres cachinnans) – The Lone Ranger of the falcon family, with that black mask! BAT FALCON (Falco rufigularis) – Seen perched up on our first and last days. SCARLET-SHOULDERED PARROTLET (Touit huetii) – A loud, screeching group came blasting by during one of our afternoon cruises along the Shiripuno River. COBALT-WINGED PARAKEET (Brotogeris cyanoptera) – Seen well, and in nice light, a few times. ORANGE-CHEEKED PARROT (Pyrilia barrabandi) – Scope views of this handsome species on our first full day of birding around Shiripuno Lodge gave us a charge! BLUE-HEADED PARROT (Pionus menstruus) – Many birds flying by, but we did nail them perched a time or two; those blue heads really stand out against that green plumage. DUSKY-BILLED PARROTLET (Forpus modestus) – We heard this tiny parrot species calling high overhead during some forest birding behind the lodge. It took some searching and persistence, but we finally locked onto them for pretty nice scope studies! 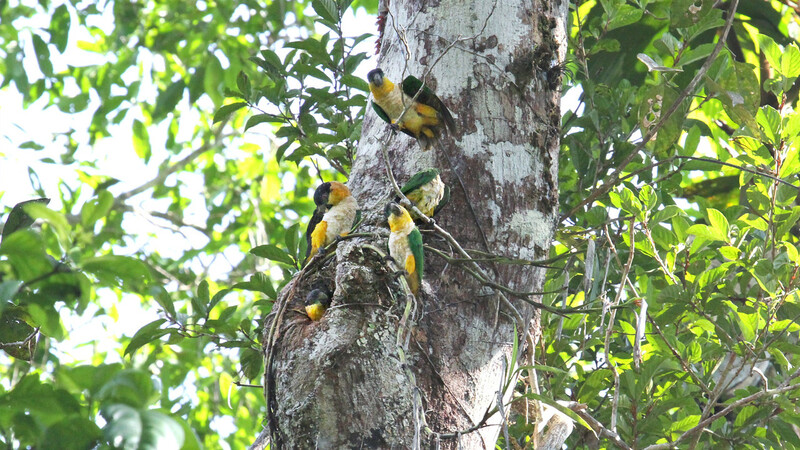 BLACK-HEADED PARROT (Pionites melanocephalus) – Fabulous scope studies at group hanging around a knothole in a large tree along the Skutch trail; we never really confirmed if they were just drinking pooled water, or were investigating a nest site, but I suspect the former. Whatever the case, we certainly enjoyed the moment! MAROON-TAILED PARAKEET (Pyrrhura melanura) – Fairly common in the area, but hard to find perched. Well, we finally did when we scoped a small group feeding at a fruiting tree near the lodge. DUSKY-HEADED PARAKEET (Aratinga weddellii) – A group flew by at fairly close range during a short birding stop on our way back to Coca. RED-BELLIED MACAW (Orthopsittaca manilatus) – Plenty of fine views of this small macaw, especially on our first day when we found a group of them feeding along the Shiripuno River. BLUE-AND-YELLOW MACAW (Ara ararauna) – Stunning, with many memorable views of this large and majestic macaw! SCARLET MACAW (Ara macao) – Killer views of them when we found a group along the Shiripuno River on our way down to the lodge on our first day. CHESTNUT-FRONTED MACAW (Ara severus) – Shiripuno is such a wonderful place for macaws, and this was yet another species that dazzled us! GREAT ANTSHRIKE (Taraba major) – A smashing male came creeping in for excellent views near the lodge. PLAIN-WINGED ANTSHRIKE (Thamnophilus schistaceus) – Nice looks at a male with a flock along the trails behind the lodge. MOUSE-COLORED ANTSHRIKE (Thamnophilus murinus) – Similar to the previous species plumage-wise, and even vocally, but still with a little experience quite identifiable; we had good looks through the scope at a female on our first full day around the lodge. PEARLY ANTSHRIKE (Megastictus margaritatus) – Outstanding views at an active male along the Puyuno trail... awesome! We saw both male and female Red-necked Woodpeckers along the Puyuno trail; this is the female. Photo by guide Mitch Lysinger. DUSKY-THROATED ANTSHRIKE (Thamnomanes ardesiacus) – Great looks at this and the following species with the understory flocks. PLAIN-THROATED ANTWREN (Isleria hauxwelli) – Nice scope views in the understory, where this species lurks. SPOT-WINGED ANTSHRIKE (Pygiptila stellaris) – Seen a few times pretty well as they moved through the canopy with flocks; the one with the short tail and hefty bill. BROWN-BACKED ANTWREN (Epinecrophylla fjeldsaai) – A specialty of the general area, and one that did its best to elude us for most of the trip, but we eventually nabbed a nice male behind the lodge when one came in for sensational studies. RUFOUS-TAILED ANTWREN (Epinecrophylla erythrura) – A tough one to see well sometimes as it is just so active and jumpy, but we did manage to clinch scope studies along the Skutch trail one morning. MOUSTACHED ANTWREN (SHORT-BILLED) (Myrmotherula ignota obscura) – Very nice scope studies of one when it popped in right over camp! AMAZONIAN STREAKED-ANTWREN (Myrmotherula multostriata) – Very nice views of a male along the Shiripuno River. WHITE-FLANKED ANTWREN (Myrmotherula axillaris) – We had good looks at a male with an understory flock! LONG-WINGED ANTWREN (Myrmotherula longipennis) – We had a pair right off the bat on our first full day around the lodge. GRAY ANTWREN (Myrmotherula menetriesii) – Fairly common with the flocks, and we celebrated some good looks at those distinctive males. DUGAND'S ANTWREN (Herpsilochmus dugandi) – A high canopy flock species that can be very difficult to see well without a tower, but we did manage to pull a male into some lower trees for pretty good looks along the Puyuno trail. YELLOW-BROWED ANTBIRD (Hypocnemis hypoxantha) – A smashing little understory antbird that we saw through the scope along the trails behind the lodge. BLACK ANTBIRD (Cercomacroides serva) – Nice looks at a pair along the lower stretches of the Mirador trail. RIPARIAN ANTBIRD (Cercomacroides fuscicauda) – Split from the more highland form, the Blackish Antbird. We had a pair come in for good looks in the river-edge growth near the lodge. BLACK-FACED ANTBIRD (Myrmoborus myotherinus) – Most folks had good looks at a male sneaking through the undergrowth along the Puyuno trail. SPOT-WINGED ANTBIRD (Myrmelastes leucostigma) – Pretty decent views at a pair as they sneaked about in the understory along the trails behind the lodge. SOOTY ANTBIRD (Hafferia fortis) – A male graced our presence along the lower stretches of the Mirador trail, some even getting scope views. BLACK-THROATED ANTBIRD (Myrmophylax atrothorax) – A local antbird of swampy forest that we saw well right near the lodge along the Bates trail. This was apparently the first report for the area, which surprised me a bit, especially since we turned up a couple of territories... nice! 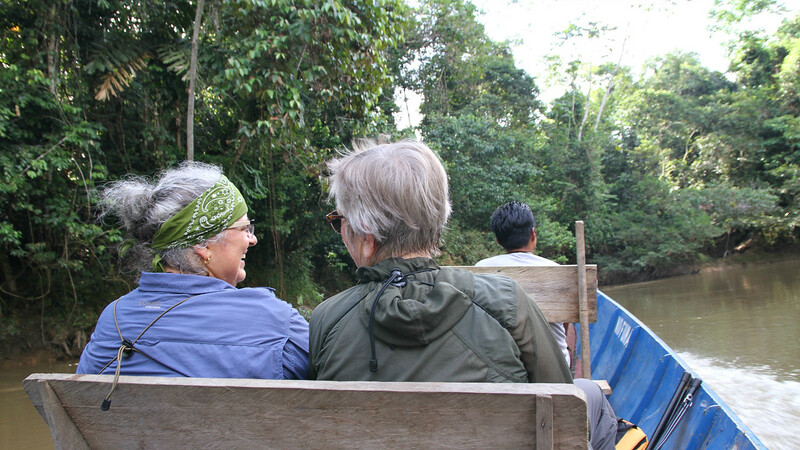 We had many opportunities to ride in canoes along the rivers, where we could see amazing birds and other wildlife. Photo by guide Mitch Lysinger. LUNULATED ANTBIRD (Gymnopithys lunulatus) – Fabulous scope studies - between it flipping about in the understory - at a male near the lodge. COMMON SCALE-BACKED ANTBIRD (Willisornis poecilinotus) – A fancy little understory antbird that we scoped along the trails behind the lodge one morning. ASH-THROATED GNATEATER (Conopophaga peruviana) – Gnateaters are usually a tricky little group of birds to tease into view due to their secretive nature, but this time a touch of persistence paid off, and scored us some fine views at a female of this terra firme species. RUFOUS-CAPPED ANTTHRUSH (Formicarius colma) – Glimpsed when one came blasting in as a fly-by! SPOT-THROATED WOODCREEPER (Certhiasomus stictolaemus) – The rarest bird of the tour, without doubt; I dare any diehard, neotropical birder to claim that they have seen this one more than once or twice. Fernando tipped me off to a spot where he had seen this one recently with a flock, so, we marched out there, slammed into a flock, and fished it out... wow! The looks were sensational as it bounced from tree to tree, and hitched about at eye-level... fantastic! WEDGE-BILLED WOODCREEPER (Glyphorynchus spirurus) – The smallest woodcreeper; we saw it a few times. LONG-BILLED WOODCREEPER (Nasica longirostris) – Shocking views a couple of times at this extraordinary woodcreeper; first we called in a pair right into the lodge area, and then we spotted one feeding in a bromeliad, all the while sporting those over-the-top bills! AMAZONIAN BARRED-WOODCREEPER (AMAZONIAN) (Dendrocolaptes certhia certhia) – We conjured one up right behind the lodge one afternoon for fine studies. BUFF-THROATED WOODCREEPER (BUFF-THROATED) (Xiphorhynchus guttatus guttatus) – Good looks at this hefty woodcreeper with a flock. PLAIN XENOPS (Xenops minutus) – With an understory flock along the trails behind the lodge. YELLOW-CROWNED TYRANNULET (Tyrannulus elatus) – Right around the lodge in the river-side trees. 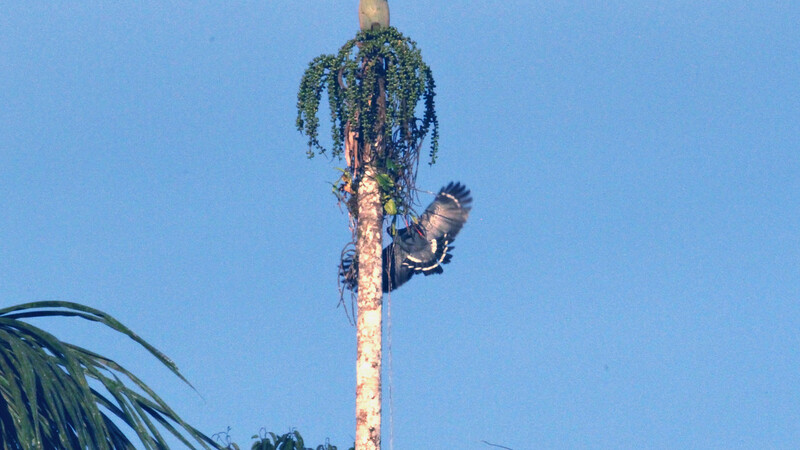 Another interesting, but unexplained, bit of behavior we witnessed was this Crane Hawk that we saw thrashing around in a palm tree; our local guide Pablo thought it was probably collecting nesting material. Photo by guide Mitch Lysinger. FOREST ELAENIA (Myiopagis gaimardii) – We called one down to eye-level right next to the lodge for nice views; this one isn't a real looker, but it can be hard to see well since it tends to spend most of its time in the canopy. OCHRE-BELLIED FLYCATCHER (Mionectes oleagineus) – Seen by some foraging in the fruiting trees next to the lodge. RINGED ANTPIPIT (Corythopis torquatus) – Once considered a member of the antbird family, this one ended up genetically being more related to flycatchers, and what a strange behavior for a flycatcher, strutting about on the forest floor like an antthrush or a waterthrush. We had to stalk this one a bit, but ended up coaxing this forest floor species out onto the trail for marvelous views. SHORT-TAILED PYGMY-TYRANT (Myiornis ecaudatus) – Brief views of this smallest of passerines. YELLOW-MARGINED FLYCATCHER (Tolmomyias assimilis) – We pulled one down from a canopy flock for good looks along the Skutch trail. YELLOW-BREASTED FLYCATCHER (Tolmomyias flaviventris) – Jan and I had one as it called actively. DRAB WATER TYRANT (Ochthornis littoralis) – A constant companion along the edges of the Shiripuno River. CITRON-BELLIED ATTILA (Attila citriniventris) – We called this handsome attila in for fabulous scope studies along the Skutch trail... nice! LESSER KISKADEE (Pitangus lictor) – Seen along the river edge a few times, this one is more slender than the Great Kiskadee, is almost always found near water, and has a very different vocal repertoire. 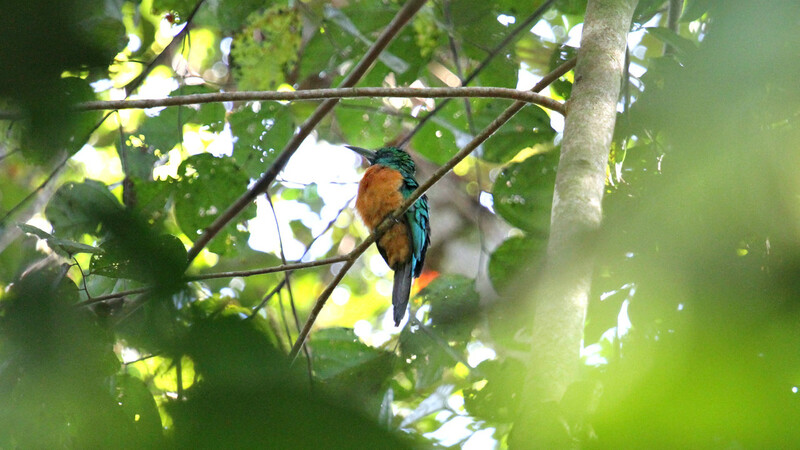 We got this Great Jacamar to come in and sit quietly while we got nice views in the scope. Photo by guide Mitch Lysinger. GREAT KISKADEE (Pitangus sulphuratus) – An iconic neotropical species with a very distinctive voice. BOAT-BILLED FLYCATCHER (Megarynchus pitangua) – A larger version of the previous species, that we saw well numerous times. SOCIAL FLYCATCHER (Myiozetetes similis) – Common in open habitats, such as along the Shiripuno River edges. GRAY-CAPPED FLYCATCHER (Myiozetetes granadensis) – Right in camp where they actively fed at the fruiting trees for nice views. STREAKED FLYCATCHER (Myiodynastes maculatus) – Common throughout the neotropics. SULPHURY FLYCATCHER (Tyrannopsis sulphurea) – We called up a pair along the Shiripuno River one morning. TROPICAL KINGBIRD (Tyrannus melancholicus) – The classic kingbird of the neotropics, known from Texas to Argentina! BLACK-NECKED RED-COTINGA (Phoenicircus nigricollis) – We heard this flashy, but shy, cotinga at four different spots; more than any of the other years for this trip. We did actually see one well when it cooperated along the Mirador trail, perching briefly for scope studies a number of times... nice! AMAZONIAN UMBRELLABIRD (Cephalopterus ornatus) – Very nice views at a female during our canoe ride down to the lodge when we caught it feeding at a fruiting tree right next to the river. PLUM-THROATED COTINGA (Cotinga maynana) – Scope views a couple of times at males out along the river... what a stunner! BARE-NECKED FRUITCROW (Gymnoderus foetidus) – The fruitcrow with the wayward, buoyant flight, that we saw well numerous times over the course of the trip. DWARF TYRANT-MANAKIN (Tyranneutes stolzmanni) – A rather lack-luster little manakin species with respect to the plumage side of things, but this one sure gets an "A" for effort as this species calls throughout the day from the subcanopy, no matter how hot it gets! We heard them a few times and finally managed to to track one down for scope views behind the lodge. BLUE-BACKED MANAKIN (Chiroxiphia pareola) – Excellent scope studies at a male along the Colibri trail was certainly a highlight! BLUE-CROWNED MANAKIN (Lepidothrix coronata) – Several fine encounters with those spectacular males really blew us away! WHITE-BEARDED MANAKIN (Manacus manacus) – Carroll and I were the only ones to find the right angle for the male that was hiding out under thick cover behind the lodge. WIRE-TAILED MANAKIN (Pipra filicauda) – Brief views of a male along the Puyuno trail... not sure where they slipped away to! STRIPED MANAKIN (WESTERN) (Machaeropterus regulus striolatus) – Most got to the scope in time to feast on the male that was in view before it flew off along the Puyuno trail. A real stunner. 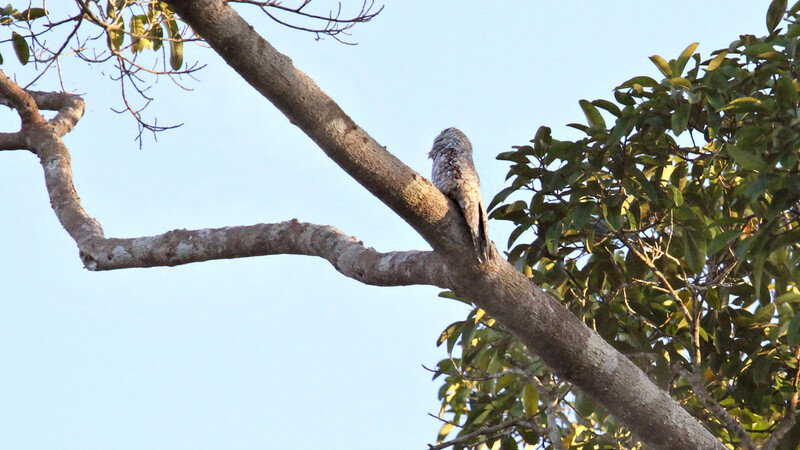 Cris spotted this Great Potoo roosting in a large tree over the river. Photo by guide Mitch Lysinger. WHITE-CROWNED MANAKIN (Dixiphia pipra) – Scope views at a clean-cut male behind the lodge dazzled us. GOLDEN-HEADED MANAKIN (Ceratopipra erythrocephala) – A smashing manakin species that we scoped at a lek behind the lodge... this ended up being quite a strong trip for manakins! BLACK-TAILED TITYRA (Tityra cayana) – The common tityra of the Amazonian lowlands that we saw well a few times. BROWN-WINGED SCHIFFORNIS (Schiffornis turdina) – We called in a responsive bird along the Wallace trail for point-blank scope views as it sang its head off... wow! CHESTNUT-CROWNED BECARD (Pachyramphus castaneus) – Scope views at a responsive pair near the lodge. WHITE-WINGED BECARD (Pachyramphus polychopterus) – Good looks at a female around the lodge. TAWNY-CROWNED GREENLET (Tunchiornis ochraceiceps) – Fairly common with the understory flocks. DUSKY-CAPPED GREENLET (Pachysylvia hypoxantha) – Well called one down from a canopy flock for pretty good looks as it danced about just overhead. VIOLACEOUS JAY (Cyanocorax violaceus) – The large, raucous jay of the Ecuadorian Amazon that we saw daily. WHITE-BANDED SWALLOW (Atticora fasciata) – An elegant swallow of Amazonian water courses, with that purple-black plumage and white chest band. GRAY-BREASTED MARTIN (Progne chalybea) – Seen on our first day at the Shiripuno bridge. WHITE-WINGED SWALLOW (Tachycineta albiventer) – Our last new bird for the trip when we spotted one zooming about over the runway at the Coca airport. SCALY-BREASTED WREN (Microcerculus marginatus) – We brought this forest understory species along the Mirador trail for views almost too close to focus on! Also known as Southern Nightingale Wren. CORAYA WREN (Pheugopedius coraya) – Point blank studies of a pair in a vine tangle along the Mirador trail next to a swamp, where this species typically hangs out. MUSICIAN WREN (Cyphorhinus arada) – Fast and darting, but we enjoyed some pretty nice views of this crafty understory species when it popped in along the Puyuno trail, and its song is always enchanting. 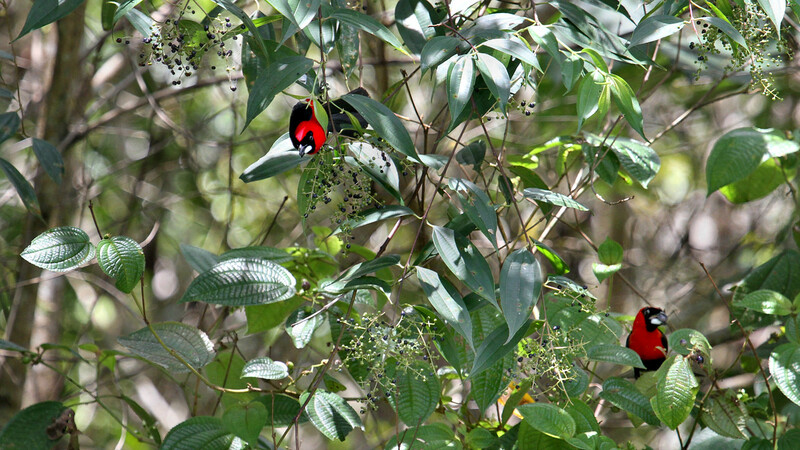 Masked Crimson Tanagers fed in the trees by the lodge everyday, allowing us to get great looks at these gorgeous birds. Photo by guide Mitch Lysinger. BLACK-CAPPED DONACOBIUS (Donacobius atricapilla) – Loverly views a couple of times at this very vocal and loud, swamp-dwelling species. BLACK-BILLED THRUSH (Turdus ignobilis) – Seen around the Shiripuno bridge in second growth; a favorite habitat for this drab thrush species. MAGPIE TANAGER (Cissopis leverianus) – The longest of all tanagers, and a stunning bird as well! We had them in disturbed habitats on our way in and out of Shiripuno. FLAME-CRESTED TANAGER (Tachyphonus cristatus) – Excellent views at males and females right around camp as they came in to feed on the fruiting trees at eye level... nice! FULVOUS SHRIKE-TANAGER (Lanio fulvus) – We scoped a male perched up in a canopy Cecropia during some forest birding. SILVER-BEAKED TANAGER (Ramphocelus carbo) – Daily around the lodge where they come in to feed on the fruiting trees around the lodge. MASKED CRIMSON TANAGER (Ramphocelus nigrogularis) – One you just never get tired of seeing, and we had them around the lodge at the fruiting trees everyday for killer views. BLUE-GRAY TANAGER (WHITE-EDGED) (Thraupis episcopus coelestis) – The Amazonian form with the white shoulder bar. PALM TANAGER (Thraupis palmarum) – Quite a fine looking bird when seen in nice light, as we certainly experienced! YELLOW-BELLIED TANAGER (Ixothraupis xanthogastra) – Although around the lodge daily, it took us some patience to finally score them for good looks around the lodge. TURQUOISE TANAGER (Tangara mexicana) – We scoped them as they foraged up in the canopy along the Wallace trail. OPAL-RUMPED TANAGER (Tangara velia) – We scoped a few of this spectacular tanager along the Wallace trail. OPAL-CROWNED TANAGER (Tangara callophrys) – Similar to the previous species, but with that bold opal brow; we had them a few times. BAY-HEADED TANAGER (Tangara gyrola) – Nice looks at this wide ranging species a couple of times; always a thrill to see! GREEN-AND-GOLD TANAGER (Tangara schrankii) – Seen right around the lodge in the fruiting trees. BLACK-FACED DACNIS (BLACK-FACED) (Dacnis lineata lineata) – We had a colorful male right around the lodge on our first full day at Shiripuno. YELLOW-BELLIED DACNIS (Dacnis flaviventer) – Awesome scope studies at a male during some afternoon birding at a no-name lake near the lodge. BLUE DACNIS (Dacnis cayana) – Another one that we had in the fruiting trees around the lodge! PURPLE HONEYCREEPER (Cyanerpes caeruleus) – Plenty of males, sporting those bright yellow legs! GREEN HONEYCREEPER (Chlorophanes spiza) – Jan spotted our first male! GUIRA TANAGER (Hemithraupis guira) – We saw what seemed to be a female of this species as it foraged with a canopy flock, which sort of surprised me, but the pale belly seemed to point to this one, rather than the similar Yellow-backed Tanager. 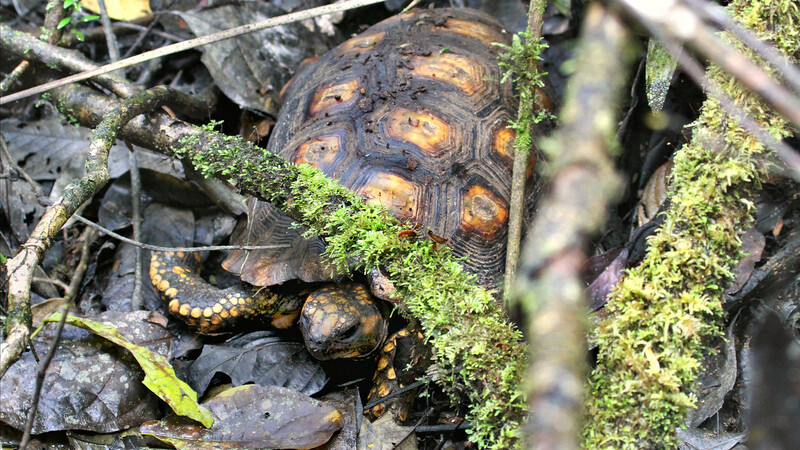 One of the non-avian creatures we found was this Yellow-footed Tortoise. Photo by guide Mitch Lysinger. BLUE-BLACK GRASSQUIT (Volatinia jacarina) – In the fields next to the Shiripuno bridge. CHESTNUT-BELLIED SEED-FINCH (Sporophila angolensis) – We had good looks at a singing male at the Shiripuno bridge. BLACK-AND-WHITE SEEDEATER (Sporophila luctuosa) – A male surprised us right next to the lodge. BUFF-THROATED SALTATOR (Saltator maximus) – Fairly common around the lodge, where we heard it at dawn chorus a few times, and even managed to see it. RUSSET-BACKED OROPENDOLA (RUSSET-BACKED) (Psarocolius angustifrons angustifrons) – The common oropendola of the Ecuadorian Amazon. GREEN OROPENDOLA (Psarocolius viridis) – We enjoyed some magnificent views of this colorful oropendola right around the lodge on our first day. CRESTED OROPENDOLA (Psarocolius decumanus) – The oropendola with the dark body and pale bill; we had them on most days. OLIVE OROPENDOLA (Psarocolius bifasciatus) – One flew by on our last day for brief views. YELLOW-RUMPED CACIQUE (Cacicus cela) – Common in the Amazon, and seen on most days around the lodge... and what a talented mimic! GIANT COWBIRD (Molothrus oryzivorus) – And it really is a large cowbird! THICK-BILLED EUPHONIA (Euphonia laniirostris) – Nice looks at the yellow-throated male. ORANGE-BELLIED EUPHONIA (Euphonia xanthogaster) – The common euphonia in Ecuador, from the Andes to the lowlands. COMMON SQUIRREL MONKEY (Saimiri sciureus) – We enjoyed some fine moments with this active and expressive little monkey species as they frolicked through the trees! DUSKY TITI MONKEY (Callicebus moloch) – We had our first encounter with them on our ride into the lodge on the first day when we spotted a group sitting lined up on a branch, non-prehensile tails hanging down straight. WHITE-FRONTED CAPUCHIN (Cebus albifrons) – Seen next to the lodge on our first full morning of birding. POEPPIG'S WOOLLY MONKEY (Lagothrix poeppiggii) – A powerful monkey species that we saw daily as they fed actively in the Cecropia trees right next to the lodge... always a thrill! WHITE-BELLIED SPIDER MONKEY (Ateles belzebuth) – Wow! Finally on our last day as we made our way back up the Shiripuno River when we spotted a couple of them right along the river edge, swinging through the trees! CAPYBARA (Hydrochaeris hydrochaeris) – Another surprise on our last day during the canoe ride back upriver when we ran into a small family group swimming across the river and then venturing up the bank... awesome views. I have only ever seen this large rodent a couple of times in Ecuador.